The unprecedented exposure of such blatantly unfair practices played a key role in reinforcing the political momentum for tax justice in Europe and prompted the development of a set of initiatives at EU level to promote fairer taxation. But these positive advancements do not apply to all the EU fields of operation yet. Paradoxically, the very financial arm of the EU – the European Investment Bank – is still lagging behind on fair taxation, right when it should play a leading role on what has become a top political priority. The European Commission already gave the bank a sign in this direction when after last December’s adoption of the first – and controversial – EU blacklist, it demanded a few weeks ago that the EIB – the “EU Bank”, fully public and controlled by the EU member states together with the European Commission – take these latest developments into account. Precisely two years ago, the Panama Papers scandal burst, leaking financial information on more than 214,000 offshore entities and bringing the whole world to face the magnitude of the phenomenon of tax evasion and avoidance. The unprecedented exposure of such blatantly unfair practices played a key role in reinforcing the political momentum for tax justice in Europe and prompted the development of a set of initiatives at EU level to promote fairer taxation. But these positive advancements do not apply to all the EU fields of operation yet. Paradoxically, the very financial arm of the EU – the European Investment Bank – is still lagging behind on fair taxation, right when it should play a leading role on what has become a top political priority. The European Commission already gave the bank a sign in this direction when after last December’s adoption of the first – and controversial – EU blacklist, it demanded a few weeks ago that the EIB – the “EU Bank”, fully public and controlled by the EU member states together with the European Commission – take these latest developments into account. Being the largest multilateral lender globally, with EUR 78 billion invested in 2017, the EIB can just not afford to treat tax justice as a side issue. Since the financial crisis, the bank has played a pivotal role in economic recovery efforts at European level, for instance in implementing the Investment Plan for Europe, and yet it has financed – and still does –projects via tax havens. In 2016 a report looking at EIB-financed investment funds concluded that between 2011 and 2015 the EIB supported private equity funds incorporated in tax havens and problematic jurisdictions like Mauritius or the Caiman Islands. Since then, the European Commission and Parliament have repeatedly called on the EIB to strengthen its tax policy. The Commission openly regretted that it had to block EIB projects “because they involved unjustifiably complex tax arrangements through harmful or no tax regimes in third countries”. 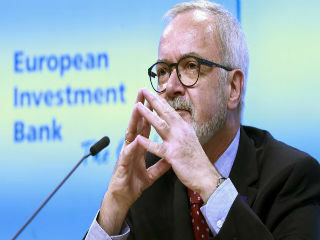 Commissioner Moscovici also wrote to the EIB President Werner Hoyer, saying that the Commission identified problematic operations led by the EIB involving ”issue of structures that make use of aggressive tax planning or other practices not complying with tax good governance criteria”, further referring to investments via funds based in the Channel Islands. While the EIB did take a step forward and adopted an “interim approach” to its taxation policy in 2017, the bank is now at a decisive crossroads, as it will soon have to review this policy to set in stone the recent improvements. But not only. In order to close the existing loopholes in its standards, it will need to go even further, pro-actively developing a broader responsible taxation policy. Among the most urgent steps in this direction, demanding public Country by Country Reporting to its clients should be for example an imperative requirement for the bank, as underlined in a new report challenging the EIB’s ability to “show the way” in the fight against tax evasion and tax avoidance. The study explains that the implementation of such requirement would mean that to be eligible for EIB’s support, all clients incorporated in different jurisdictions should disclose information about their sales, assets, the number of employees, profits and tax payments in each country of operation. This measure would ensure that the bank only invests in financially sustainable projects with little risk of contributing to the tax avoidance strategies sometimes implemented by large firms benefitting from EIB’s support and thus rules out any project that doesn’t meet these standards. In the past the EIB has often resisted taking similar bold stances, using the justification that the responsibility to set such trends would rather lie with a legislative body. However the bank puts it this time, there are no more excuses: the EIB should require a policy framework that allows it to take a proactive and responsible approach to tackle abuses wherever they may appear. We can’t forget that the EIB is a public institution and supports projects in the name of EU policies, such as cohesion or development. It is thus high time for the EU bank to ask for more than what commercial banks do — they are required to publish their own public Country By Country Reports, by the way — for the sake of justice and broader public interest. *Xavier Sol is the director of Counter Balance. Antonio Tricarico works for Re: Common, formerly the Campaign to Reform the World Bank (CRBM).